In the course of my reading about things rugby, my eye chanced upon game statistics on the Highland RFC in Salt Lake City, Utah. They've had a winning record of play for years (this is indicated in a table below), and seem to dominate the men's high school age rugby competitions. I wondered how this came about in what one might think to be an unlikely place (Utah), primarily known for its large population of Mormon Church (LDS) members. I contacted the club's longtime coach Larry Gelwix by e-mail to find out. What follows is an interview about this notable force in U.S. high school rugby. Describe yourself and your association with Highland Rugby. I was born and raised in the Bay Area, California. I attended Brigham Young University where I received my B.A. in Communications and M.A. in Organizational Communications. During my time at BYU I became involved in rugby. After returning from my mission for the Mormon church I became friends with a guy from New Zealand who played on the BYU rugby team. I would go and watch him play and, having played football in high school, became interested in the game. I tried out for the team and played three years for BYU. My position was scrum-half. Following my graduation from BYU, I accepted a teaching position in Salt Lake City at Highland in 1975. In addition to private religious classes, I taught one PE class and coached varsity football and wrestling. It was in the spring of my first year teaching that I decided that what every young man needed was to play rugby, so I organized a team. I made announcements and put up some posters and thought that because rugby was such a great game, everyone would want to play. We had six boys show up at our first practice! I started recruiting some of my football players and soon we had enough for a team. I left teaching in 1979, but have continued as a rugby coach. Professionally, I serve as Chairman and CEO of Columbus Companies, Salt Lake City, Utah. I have now coached the Highland Rugby team for 25 years. I started out as a young man and now I'm an old man! Typically we have 100-120 young men come out for rugby. Our practice started March 6 and we had 115 boys show up. I have a "no cut" policy, but as we get into training there is a natural attrition. The teen years are a tough time. I have strong feelings about telling a young man who is willing to pay the price and do the work, "Sorry, but you're cut!" It sends the wrong message. I know that "cuts" are a part of real life, but as long as I'm in charge of the team cuts won't be a part of it. Kids these days are too psychologically fragile. Our program is hard and it's demanding. It requires a lot, and many players are just not up to it. But every boy who is willing to do what we ask of him and put in the time, we keep. Besides, we sometimes find a few "diamonds in the rough!" The Highland Rugby program is not sponsored by the school. To achieve varsity status in Utah, more than half of the schools must adopt and play the sport. Until this happens, the sport is not sponsored by the Utah High School Activities Association. In addition to rugby, water polo, competition skiing, lacrosse, and ice hockey share unofficial status. Also, with Title IX requirements pressing on most schools, the possibility of adding another boys' sport is almost nil. If it were only up to our school's officials, rugby would be a sponsored sport. We enjoy a very close relationship with the school and its administrators, albeit an unofficial one. Under freedom of access laws, we are able to use a school football field as our practice area, use classrooms and a locker room. We pay a rental fee to the school district for these facilities. Please describe the rugby program at Highland. Practice begins the first Monday of March every year and runs through late May. This puts us at a disadvantage with the West Coast schools (and others around the country) who start playing in January. But since we are in snow country, we have no other choice. We usually start the year with 100-120 boys, but due to the demanding nature of our program we usually find ourselves with about 70-80 players finishing the season. We have an all-volunteer staff. None of our coaches receives any compensation. We practice every day Monday-Friday and play most of our matches on Saturday. There are many styles of play around the country and around the world. I suppose the Highland program would most closely model itself after a New Zealand style of play wherein we involve our forwards in all aspects of the game. I believe that year in and year out, our loose forwards are as good as you will see at the high school level. I believe the Highland Rugby team is unique among high school programs. We have a very strict code of conduct and behavior, and we enforce our rules. Players are expected to refrain from alcohol, tobacco, drugs, rowdy behavior, and any unseemly conduct. In fact, our broad team rule is that "you do not do anything that would embarrass yourself, your family, the team, or your faith." We talk at length about honor and integrity. I stress to the boys that if they lose their honor they have lost everything. If players violate any of our team's rules, they are suspended from the team. The player, his parents, and I meet together and discuss his possible return. There is one rule, however, that if they break they are suspended for the season: honesty. If they lie, at home, at school, at rugby, or anywhere, they're gone. It has been my unfortunate experience to suspend players for lying, including 1st XV players and team captains. Some people may laugh and scoff, but I have found that players and parents appreciate and support the teaching of moral values. If this were only about rugby, I would have retired years ago. As a team we do our best to stay involved in local and community affairs. We have done volunteer work with local schools, hospitals, youth organizations, yard work service projects for the elderly, widows, and needy, and civic groups. It's all part of being on the team. What we are trying to do through rugby is help these young men grow up to be responsible people. 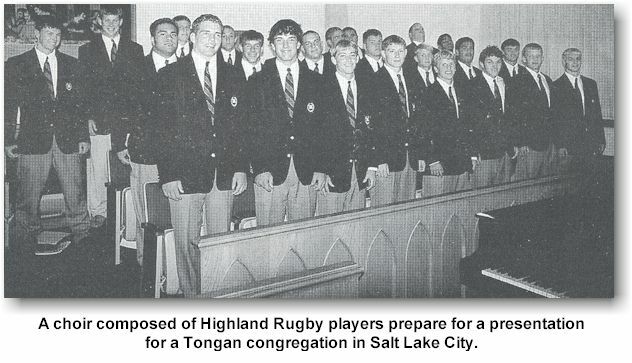 What is the relationship between Highland High School in Salt Lake City and Highland Rugby? The Highland Rugby team is not an officially sanctioned sport at Highland High School. It is important to note that we refer to ourselves as "Highland Rugby," not Highland High School Rugby. This is an important distinction. The reality is, however, that we are often "associated" with the school in the eyes of the community. It is estimated that about six to eight high school age rugby teams in the U.S. are actually sponsored by a school. This is probably about 1% of the total. Liability and Title IX issues have taken their toll. A more appropriate question to ask is this, "Is there a strong non-U.S. contingent at the school?" Highland High School is a designated ESL (English as a Second Language) school. Depending upon the school year, between 25% to 30% of the student body are enrolled in the ESL program. Immigrants, refugees, etc. that come to the Salt Lake area have the children enrolled at Highland because of the excellent English language program. At present, 37 languages, other than English, are spoken by students as a first language at Highland. Talk about diversity! Many students come here with little or no English speaking ability. While we get students from all over the country, presently the majority of students come from Latin America, the South Pacific, and Eastern Europe. We are seeing more African students of late. Several years ago we saw a flood of Southeast Asian immigrants. Naturally we have some non-U.S. citizens who are students and participate in most all sports at the school, both sanctioned and unofficial sports. (You hear more Spanish being spoken on the Highland soccer team than English!) Although rugby has more students participating than football at Highland, there are more non-U.S. students playing football than are playing rugby. We have a large number of Polynesians living in Utah. The entire population of the Kingdom of Tonga is 100,000. It is estimated that 50,000 Polynesians live in Utah, the vast majority being Tongan. It must be noted, however, that the majority of children of Tongan ancestry living in Utah were born here, consequently, they are U.S. citizens. I have never felt that our boys have received the recognition they deserve. Eleven national championships in fifteen years! Highland is the only team in the country to have appeared in all fifteen tournaments and have reached the finals fourteen out of fifteen years. We practice every day for 2-22 hours. The boys have a year-round strength and conditioning program, which I coordinate with Highland's head football coach. We keep the boys' profiles on computer to track their progress. Our fitness and training program is demanding and tough and it's all done on their own time outside of practice. In 1994 we had a young man, Patrick Dours, move to Salt Lake City from the Seattle area. 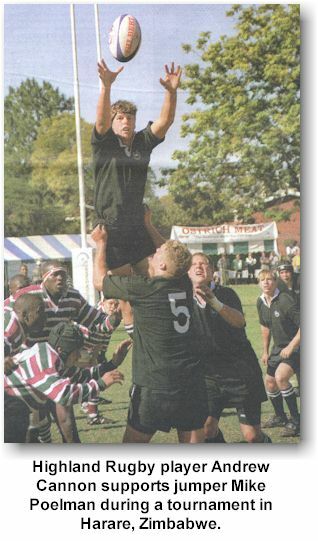 He had played two years for Redmond (High School) Rugby and had played against us in the 1993 semi-finals at nationals. Now living and attending school here, Patrick came to play rugby with us. Patrick started at 2nd 5 (#12) for us the next two years and was elected captain his senior year. He told an interesting story. He said that he grew up loving rugby and "hating Highland." He told us the members of his family were Redmond rugby fanatics and they also hated Highland. In fact, he said, Highland would be talked about at the dinner table and what a bunch of bums we were. The irony, of course, was that this Highland-hater now played for Highland! We won the championship both his junior and senior year. He told us that he and his friends had made a pact when they were in 8th grade and planning to all play rugby together for Redmond that they would win a national championship. They stuck together and had every intention of fulfilling their dream. Then, Patrick moved to Salt Lake City and played for the enemy. Here's what Patrick said, AI always thought Highland just showed up and took the trophy home and I hated you guys for this. I never had any idea how hard Highland works. I have never worked or trained so hard in my life. Now I know why Highland wins." There's a good ending to the story: In the 1994 championship match we played Redmond. All of Patrick's old friends were across the ball from him. We beat Redmond 60-6 and dedicated the match to Patrick. As you pointed out, Highland has an impressive record in the Men's High School U.S. National Championship. To what do you attribute this excellent record? USA Rugby began sponsorship of a national high school tournament in 1985. Prior to this two coaches got together decided to have a tournament, decided whom to invite, and called it a national championship. We suffered a tough loss in the 1999 semis, losing 15-14 to Jesuit (Sacramento), a team we had beaten the month prior in Sacramento 54-17. In 1998 the first ever World Schools Rugby Championship was held. The sponsored tournament invited what they considered the top twelve high school teams in the world. In selecting the best teams, they wanted schools geographically dispersed throughout the world. We were honored to be the only team in the Western Hemisphere included. The two-week event was held in Harare, Zimbabwe, Africa. The level of competition was off the charts. Frankly, there was some public wondering why an American team had been included. The twelve teams were divided into four pools of three teams each. The event was televised in Europe, Africa, Australia, and New Zealand. We surprised the tournament and media when we won our pool and advanced into the semi-finals. We met the tournament favorite Kelston Boys High from Auckland, New Zealand (and the New Zealand high school champion) and got beaten. Kelston went on to win the tournament with a convincing win over Monument High School from Johannesburg, South Africa. I attribute our impressive record to hard work, hard work, and more hard work. I really do. We have the best coaching staff (ten coaches) and young men who are dedicated. They understand goal setting. We talk at length about playing hard without being hard guys. If you ever saw our boys play you would see "hard" rugby, but never cheap rugby. Tradition also plays an important role on our team. The alumni come back often and talk to the boys about what it means to wear the black jersey. I even have the sons of my early players playing for me now and I bring out photos and films of their fathers playing. "It doesn't matter who scores, it only matters that we score!" The team is bigger than any player or any coach. We put our personal wants and wishes aside for the sake of the team. We sacrifice for the team. We have dominated because we get the best athletes in the school, they work hard and train hard, and, I believe, are properly coached. What attracted the non-U.S. players to Salt Lake City? Utah has become a popular place for immigration because we have so much space here and the economy is so good. There is virtually no unemployment here. The LDS Church is also a major draw. Many people want to come to "Zion." Highland High School gets a disproportionate share of immigrants because of the English program. Who are the outstanding players that we should keep an eye on? We have a lot of good players and several potential "future Eagles." We do, however, face a challenge. Given that 75% of the population here in Utah is LDS, it is a safe assumption that a similar number of our team is LDS. Almost all of our LDS boys go on missions for two years. When they return some become involved in rugby, some don't. Sunday play does become an issue with most. Highland does not play on Sunday. We would walk away from the national tournament before changing this policy. I am not standing on my soap box preaching to any or telling anyone what they should or shouldn't do on Sunday; I'm dealing with minors and as such I feel a huge responsibility for their behavior and the example we set as coaches and adult leaders. As for the future Eagles, maybe I'll just wait on that. The Sunday play takes out most of them. I say "potential" because they have the potential. If somebody reading this is interested in the Highland RFC program, who are contacts and how would he get more information? 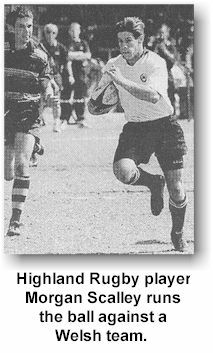 Photographs courtesy of Highland Rugby via the 5 September 1998 (LDS) Church News. Click here for the (LDS) Church News article about Highland Rugby. Click here for yet another article about Highland Rugby.